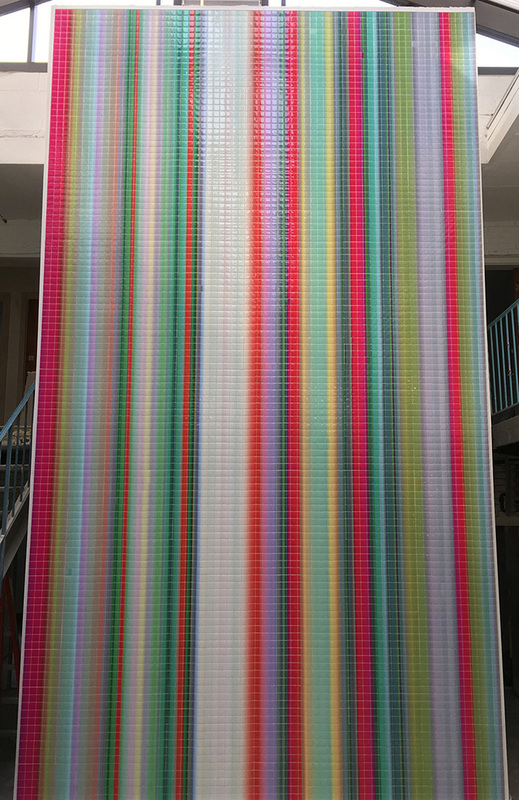 At 20 feet high and more than 11 feet wide, Strata Veil commands the atrium of the newly renovated Downtowner hotel in Saratoga Springs, New York. Printed on thousands of tiles, its dramatic verticality counterpoints the horizontal expanse of the atrium and throws waves of contrasting color across the otherwise monochromatic elevation. During the day, sunlight passing through the panes of a translucent skylight creates shadows that rake the mural’s strata in ever-shifting diagonal lines.